My friend Joel is always a good source of interesting things to do. He recently came up with a great day out. 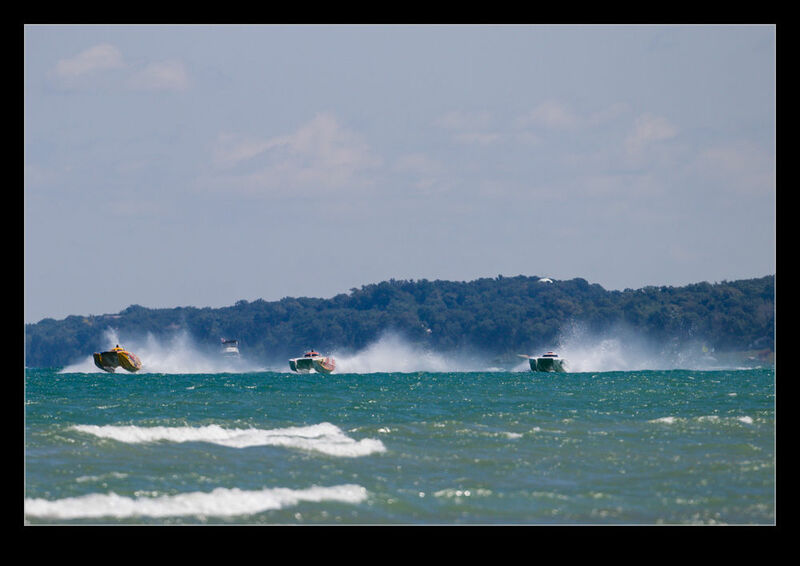 Michigan City in Indiana plays host to an offshore power-boating race. The offshore boats are substantial boats that are capable of operating well out in the water. In this case, though, the course was set close in to shore so it was easy for spectators to watch. Offshore powerboats are pretty impressive beasts. They are big boats and come in a variety of designs. The most obvious distinction is whether they are a monohull or a catamaran. That seemed to make a big difference on this course which had two straights with a pretty tight turn at each end. The cats seemed to be far better suited to making the turn than the monohulls and that advantage was not to be overcome in the races. The boats have two crew on board. 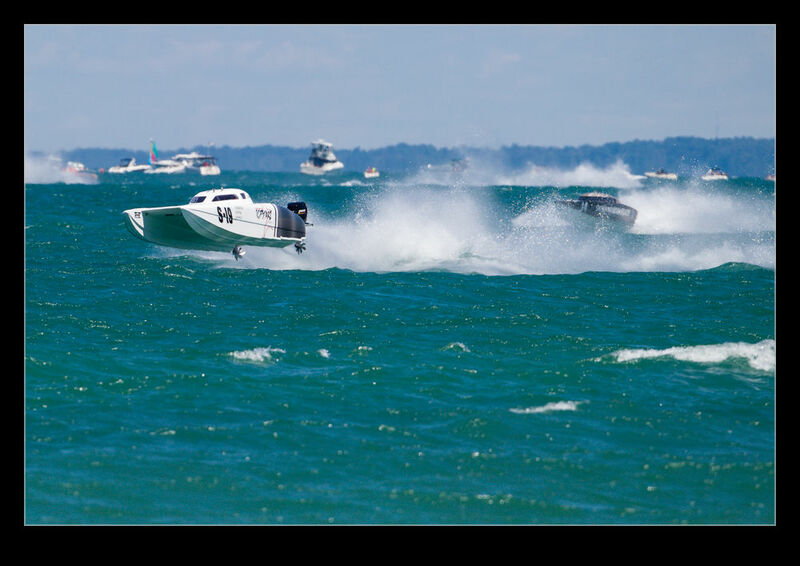 For those that are not familiar with this type of power boating, one is the driver and the other is the throttle man. Driving seems pretty self explanatory but the throttle job is a lot more nuanced than you might guess. 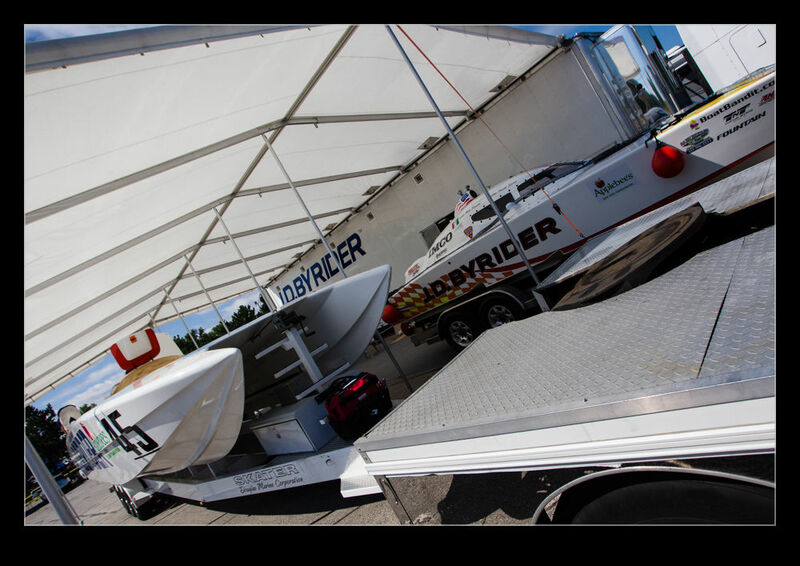 These boats have very big engines and deliver a huge amount of power to the props. If they were racing on a smooth surface, all might be okay and you could set your power and go. However, the water is not smooth and so the boat tends to jump around a lot. The trim of the boat can be set by flaps on the back but, every time the boat gets airborne (and they get airborne quite a lot), the props can come out of the water. This is when the throttle man earns his cash. A powerful engine that suddenly goes from pushing against a propeller in water to pushing against air is liable to accelerate very rapidly. In days gone by, the outcome of this was a cooked engine. Apparently, the limiters on the engines now work pretty well but it is still an art to maintaining the power when in the water but pulling it back as the props come clear of the surface. There is a lot of cycling on the throttles during a race. The part that the crew like the least is, conversely, the part that the spectator likes the most. As I go through images, the ones that look the most dynamic are the ones when the boat is out of the water. 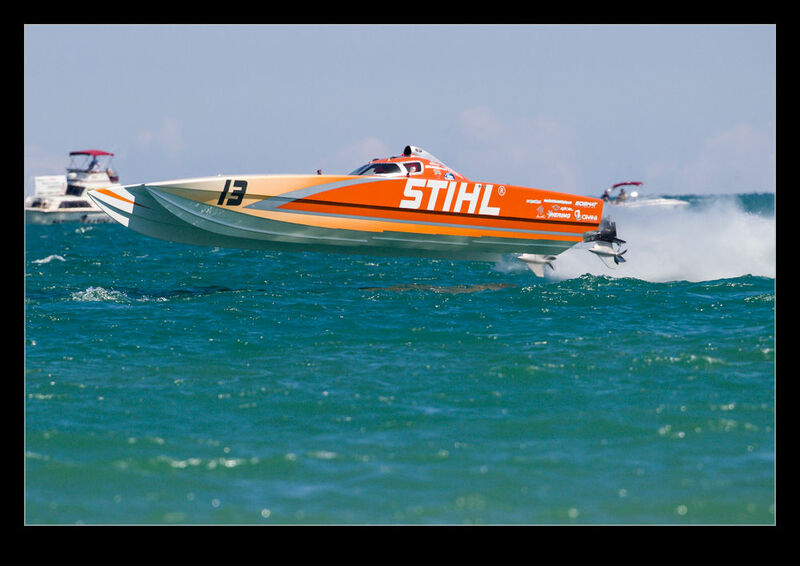 Look at a shot of a powerboat low in the water and it is hard to appreciate that it is really moving. See it in mid air as it launches off a wave with the props spinning in nothing much and you know that it isn’t hanging around. Being in the air is bad for the crew for more than one reason. With no prop in the water, there is no thrust. Admittedly, the air resistance is less than they get in water but, when up on the step and with the prop doing its work, they are best able to move on. Of course, the thump that is the return to the water is not comfortable, even with the shock absorbing seats they have, and it slows them down a bit too. It would be remiss of me to not mention that there were some aviation themed opportunities at the races too. A helicopter was filming the races and a couple of planes were flying by during breaks in the racing. However, they will get their own posts another day. Thanks for the suggestion and the company Joel and it was good to meet Chris as well, an ex-pat Welshman with an aerospace background! We Brits get everywhere! 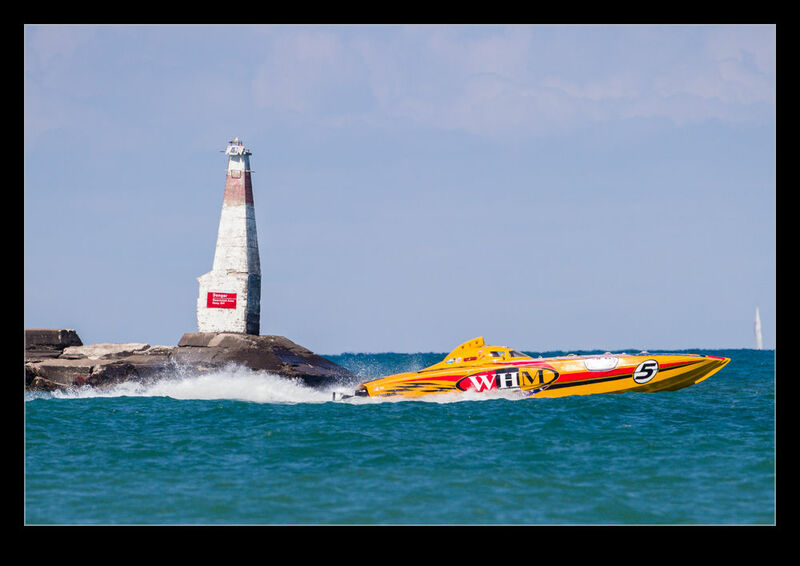 This entry was posted in photo, sport and tagged indiana, Lake Michigan, Michigan City, offshore, powerboat, races, racing. Bookmark the permalink.